Corsa Coal Corp. (TSXV: CSO) announced today that it has commenced operations at its new, state of the art, coal preparation plant, and is now producing low vol coking coal with its first train shipments of product to begin in July. The Company's coal preparation plant is located near Somerset, Pennsylvania, on the CSX rail line and only 170 miles from the Port of Baltimore. With a name plate capacity of 400 raw tons of coal an hour, at full capacity the plant has the ability to produce up to 1.8 to 2 million clean tons of met coal annually. The Company's permanent rail load out facility can handle 120 car unit trains ensuring Corsa a competitive freight rate. Currently the Company has a met coal inventory of approximately 100,000 raw tons stock piled from its operations and purchase program to date that is being processed at the plant. In addition to existing inventory, immediate plant feed will be provided from the Company's four producing surface mines as well as coal purchased from other local mining operations. In addition, two other surface mines and one underground mine will commence production in 2011, all of which coal will be processed at the Company's plant. The Plant surface mine is scheduled to commence production by July and the Hastings surface mine is scheduled to commence production by September. The Casselman mine, the Company's major new underground mine, will commence production in July. The arrangements in place for the sale of 500,000 tons of metallurgical coal from April 2011 to March 2012 at current world prices are expected to result in net prices to Corsa of approximately US$170 per clean ton FOB rail car subject to normal industry discounts based on coal specifications. Shipments under this agreement will commence in July 2011. This contract represents approximately 70-75% of the Company's expected sales tonnage during this period of time and provides the Company with the flexibility to enter into other sales arrangements and to take further advantage of the current robust market. First shipments of met coal commenced in May, and in the period to mid-June sales of met coal totalled approximately 30,000 raw tons (approximately 22,000 clean tons) at prices effectively above US$170 per clean ton taking advantage of the current tightness in the market for low volatile metallurgical coal. The Company continues to target fiscal 2011 met coal sales at approximately 500,000 tons. This is intended to be comprised of approximately 250,000 tons from production from the Company's mines and the balance from coal purchase agreements with other producers. With the purchase of the Casselman mine, the Company now expects fiscal 2012 coking coal sales to increase to approximately 1 million tons, which is expected to be made up of approximately 700,000 tons from the Company's mines and 300,000 tons from coal purchase agreements with other producers. This deposit meets the definition of an indicated coal resource as per National Instrument 43-101; Standards of Disclosure for Mineral Projects ("NI 43-101") (see "Independent Qualified Person and Technical Reports" below). The Company recently announced the addition of 16.2 million indicated tons (in situ) of low vol coking coal at the Casselman mine and 29.5 million indicated tons (in situ) of low vol coking coal with the Alumbaugh expansion of the Acosta Deep project. Shareholders are reminded that the Company's Annual and Special Meeting will be held tomorrow, Friday June 17, 2011 at 10:00am at the Toronto Board of Trade – 1 First Canadian Place, Suite 350. 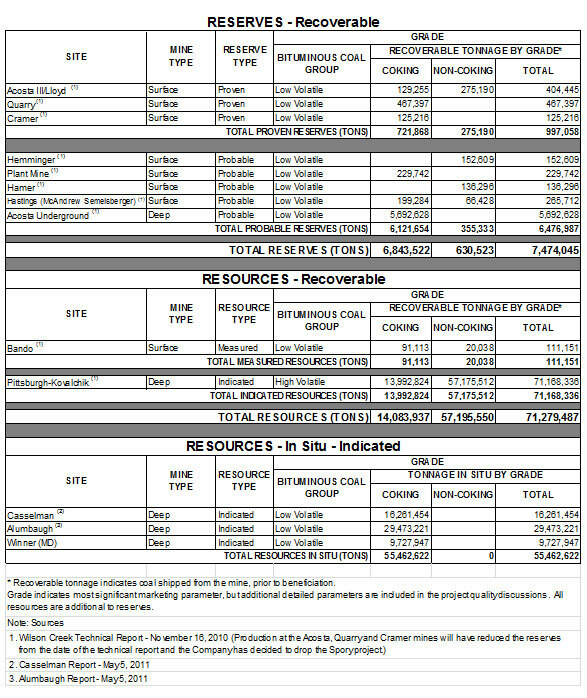 The mineral reserve and resource estimates have been prepared under the supervision of, and the technical information in this news release was verified and approved by, Dennis Noll of Earthtech Inc., a qualified person, as such term is defined in National Instrument 43-101: Standards of Disclosure for Mineral Projects. Dennis Noll is independent of Corsa. A technical report (within the meaning of NI-43-101) has not been prepared in respect of the Winner underground project. The effective date of the estimate of the mineral resources for the Winner project contained in this press release is June 15, 2011. The estimate of mineral resources reflects known environmental, permitting, title, and other relevant matters. The footprint will require further definition in the following areas in order to achieve the classification of a coal reserve: surface and mineral control, mineability related to geologic conditions, and economic viability. The Winner mineral resource referred to in this press release has not been classified as a mineral reserve and a feasibility study has not been completed. Accordingly, the economic viability of the proposed Winner project operation has not yet been demonstrated. A technical report (the "Wilson Creek Technical Report") prepared in accordance with National Instrument 43-101 entitled "Amended and Restated Technical Report on Coal Reserves and Resources; Wilson Creek Energy, LLC; Somerset, Cambria and Washington Counties, Pennsylvania and Garrett County, Maryland, USA, dated November 16, 2010" in respect of Acosta III/Lloyd, Quarry, Cramer, Hemminger, Plant, Hamer, Hastings (McAndrew Semelsberger), Acosta Underground, Bando, Spory and Pittsburgh-Kovalchik has been filed on www.sedar.com. The technical report describes the exploration history, geology and resources of these properties. Details of the quality or grade of each category of mineral resources and key assumptions, parameters and methods used to estimate the mineral resources are included in the technical report. The technical report also includes production projections for the reserves as well as a description of environmental and permitting matters. Sales projections expressed in tons that differ from the Wilson Creek Technical Report are due to revisions by the Company since the date of the report as a result of operational modifications and outside coal purchases. A technical report (the "Casselman Report") to satisfy the requirements of NI-43-101 entitled "Technical Report for Wilson Creek Energy, LLC, Coal Resources for the Casselman Mine Site in Garrett County, Maryland, USA, Dennis A. Noll, P.G., C.P.G., Earthtech, Inc., May5,2011" has been prepared and filed on www.sedar.com in respect of the Casselman mine. A technical report (the "Alumbaugh Report") to satisfy the requirements of NI-43-101 has been prepared and filed on www.sedar.com with respect to the Alumbaugh Extension of the Acosta Deep Project and is entitled the "Technical Report for Wilson Creek Energy, LLC, Coal Resources for the Alumbaugh Property in Somerset County, Pennsylvania, USA, Dennis A. Noll, P.G., C.P.G., Earthtech, Inc., May 5, 2011". The estimate of mineral resources in the Casselman Report and Alumbaugh Report reflects known environmental, permitting, title and other relevant matters. The footprint will require further definition in the following areas in order to achieve the classification of a coal reserve: surface and mineral control, mineability related to geologic conditions, and economic viability. The mineral resources referred to have not been classified as a mineral reserves and a feasibility study has not been completed. Accordingly the economic viability of the proposed Casselman Mine operations and the Alumbaugh property has not yet been demonstrated. Certain information set forth in this press release contains "forward-looking statements" and "forward-looking information" under applicable securities laws. Except for statements of historical fact, certain information contained herein constitutes forward-looking statements which include management's assessment of future plans and operations and are based on current internal expectations, estimates, projections, assumptions and beliefs, which may prove to be incorrect. Some of the forward-looking statements may be identified by words such as "estimates", "expects" "anticipates", "believes", "projects", "plans", and similar expressions. These statements are not guarantees of future performance and undue reliance should not be placed on them. Such forward-looking statements necessarily involve known and unknown risks and uncertainties, which may cause Corsa's actual performance and financial results in future periods to differ materially from any projections of future performance or results expressed or implied by such forward-looking statements. These risks and uncertainties include, but are not limited to: risks that transactions referred to will not be completed; liabilities inherent in coal mine development and production; geological, mining and processing technical problems; inability to obtain required mine licenses, mine permits and regulatory approvals required in connection with the mining and processing of coal; unexpected changes in coal quality and specification; variations in the coal preparation recovery rates; dependence on third party coal transportation systems; competition for, among other things, capital, acquisitions of reserves, undeveloped lands and skilled personnel; incorrect assessments of the value of acquisitions; changes in commodity prices and exchange rates; changes in the regulations in respect to the use, mining and processing of coal; changes in regulations on refuse disposal; the effects of competition and pricing pressures in the coal market; the oversupply of, or lack of demand for, coal; currency and interest rate fluctuations; various events which could disrupt operations and/or the transportation of coal products, including labor stoppages and severe weather conditions; the demand for and availability of rail, port and other transportation services; and management's ability to anticipate and manage the foregoing factors and risks. There can be no assurance that forward-looking statements will prove to be accurate, as actual results and future events could differ materially from those anticipated in such statements. The reader is cautioned not to place undue reliance on forward-looking statements.